Former Chester defender Paul Raynor died recently after a long illness. Our condolences go out to his family and friends. Paul was one of many successful products of Cliff Sear’s youth scheme at Sealand Road during the 1970s. As a youngster he had trials with Bolton and Shrewsbury but the persuasive Sear convinced him to join his home town club. Paul represented Chester schoolboys at all levels and was a member of the Cheshire County squad that toured Germany in 1973. Paul was given an initial taste of first team football in January 1975, at the age of 17, in a Welsh Cup tie against Oswestry. This was followed by a further Welsh Cup appearance, against Cardiff, the following campaign. After signing professional terms, in summer 1976, he was given his Football League debut at Crystal Palace in September. The game marked the first game in charge for Alan Oakes, after the departure of Ken Roberts, and the player-manager immediately promoted Paul into the side as a replacement for Tony Loska. It proved a dream debut for Paul as Chester won the game 2-1 and the youngster set up the winning goal for Stuart Mason four minutes from time. 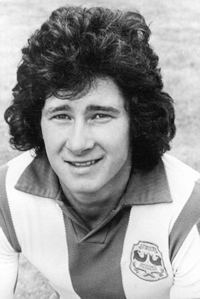 Paul kept his place in the side until the signing of Jim Walker in November but then became a regular first team player in 1977/78 when he took over the right back role from Nigel Edwards. Over the next five seasons Paul was an almost constant presence in Alan Oakes’ Third Division side but was released at the end of the 1981/82 season, when he joined Oswestry Town, following Chester’s relegation to the basement division. At the start of the 1983/84 season Paul made a surprise return to Sealand Road when John Sainty brought him back from Oswestry on non-contract terms but after a further three league games he left the club. As a steady, reliable defender Paul rarely got the chance to press forward and all but one of his nine goals for Chester came from the penalty spot. His most notable strike came in a Second Round FA Cup tie against Barnsley in December 1979. His cooly taken penalty, late in the game, put Chester through to a Third Round tie at Newcastle. After leaving the game Paul moved to Nantwich and worked for Cheshire Constabulary. He is survived by his wife Sue and two children.